Finance Made Easy Series has been designed to cater to managers and executives with little understanding of finance and little time to read treatises on it. 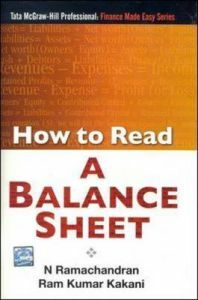 How to Read a Balance Sheet focuses on Balance Sheet, arguably the most important and revealing of all financial statements of any business organization. A lucid, creative and concise exposition of financial statements, their components, jargon and computational methods along with short stories and numerical examples makes for an engaging read for busy professionals. Dr N Ramachandran, fellow of IIM-Calcutta, is the principal consultant with Management Advisory Services, Kochi, Kerala, with over three decades of academic experience at his alma mater and Asian Institute of Technology (AIT), Bangkok. He has also been a consultant to government and non-government agencies in various countries including India, Thailand, Laos, Sri Lanka, Cambodia and Vietnam. Ram Kumar Kakani, fellow of IIM-Calcutta, is Associate Professor at XLRI, Jamshedpur, with a rich experience in corporate sector. A recipient of the AIMS Best Young Teacher Award (2005) and ranked among the top 1% of the Social Science Research Network (SSRN) authors (2007), Kakani has co-authored popular textbooks.